Classic minimalism — as it coalesced in New York under La Monte Young's influence, and as epitomized by the early works of Steve Reich, Terry Riley and Philip Glass — was founded on two key concepts. The first is the droning or short-term repetition that creates the "LP needle stuck in a groove" effect that was so confounding to many people when they first heard it. The second is the idea of form as a result of musical process, a principle that in North America originated with Ives and reached an apogee with the seminal Reich, Riley and Glass compositions of the 1960s and 1970s. Reich's own article from 1968 acknowledges the concept explicitly in its title: Music as a Gradual Process. The very first piece in this tradition of minimalist process music is usually considered to be Riley's In C, premiered in 1964. 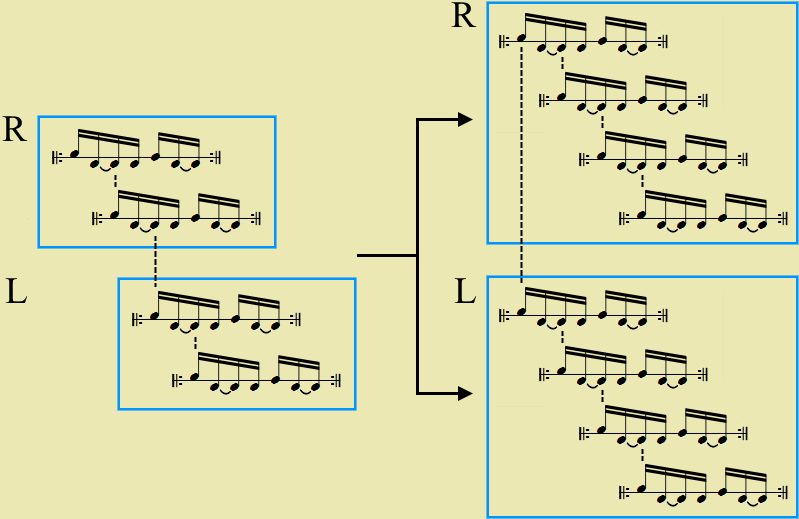 It's process is basically a tonal one in which musicians make their way gradually through 53 composed repeating fragments whose modality gradually moves from C major to G minor. 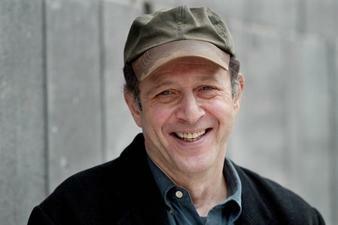 With Reich though, the process is always a rhythmic one. 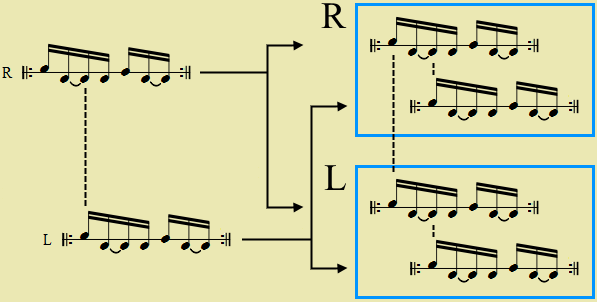 This initially took the form of phase shifting, where two otherwise identical lines are allowed to drift out of sync until one is a full beat ahead of its copy (below we'll look closely at a famous example of this, the tape piece Come Out). A different, degenerative type of process is evident in Pendulum Music (1968), where microphones are swung over the loudspeakers to which they're connected, creating feedback pulses that gradually lengthen into sustained high pitches. And then there's Four Organs (1970), unique even for Reich, basically a 20-minute rhythmic elaboration of a single dominant 11th chord. 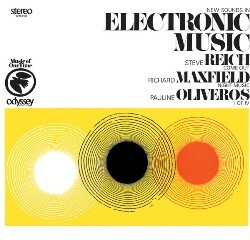 The electric organs referenced in the title start on sharp tutti chords separated by rests, and gradually elongate the chord into sustained notes that get longer and longer before being successively released, leaving only a high A-E at the end. Throughout the work's 20 minute duration a beleaguered maracas player is bidden to maintain a steady eighth note beat. All the other musical parameters are made subservient to the rhythmic process: there are no new pitches introduced, nor changes in timbre or loudness. It wasn't until after Reich went to Ghana in 1970 to study the drumming tradition of the Ewe people that his most recognizable style took shape: percussion-centric ensembles playing highly contrapuntal modal music built from short, repeated, syncopated phrases. This is the sound world of his most famous works (such as Music for 18 Musicians and Music for Mallet Instruments, Voices and Organ), wherein the predominant musical process is usually the expansion and contraction of musical phrases by successively doubling or halving their length. Most of these classic works have been analyzed extensively, both because they're of high quality and because they're relatively straightforward for analysts, having readily available scores with far fewer notes in them than a typical Schoenberg or Carter composition. But there's one important Reich piece from this period that has largely escaped this scrutiny, mainly because it has no score. And that's the piece we'll turn to next, using the occasion to build our own transcription. Reich's earliest extent pieces are experiments with snippets of speech, recorded on loops of audiotape that are repeated and layered and gradually allowed to shift out of phase. Come Out, from 1966, is the most famous of these, and it's about as elemental as you can get. The sole sound source is the recorded testimony of a young man from Harlem who was a victim of false arrest and police violence. He describes having to make a bruise on his body bleed visibly before the police would take him to the hospital. I'll notate the work as it has been issued on various Nonesuch CDs over the years, a version of the piece that's shorter and higher in pitch (in other words mastered at a faster tape playback speed) than the version on the 1967 Odyssey LP that was the work's first commercial release. At this density the canon has turned into a blur of sound. What began concrete has become abstract, what began as speech has become music. 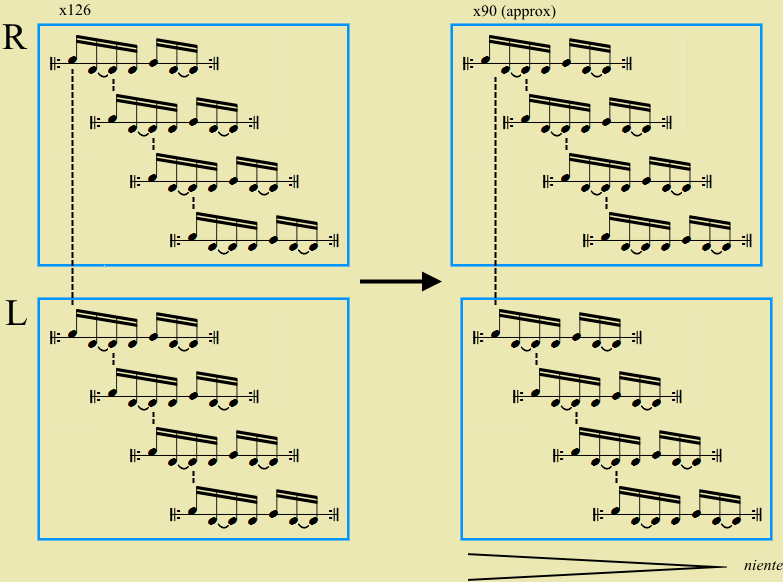 And the quadruple meter effect of the four-voice canon in each channel (entrances on successive "eight note" values in our transcription) now predominates over the off-kilter septuple feel of the original loop, so that the sound stream has become more rhythmically regular. Come Out was premiered at a benefit concert for the legal defense of the falsely accused African-American youth whose voice it features. That was in 1966, so this year marks the work's 50th anniversary. It still has the edge of a groundbreaking piece that's musically relevant today. More poignantly, recent events have confirmed that the work's underlying political context and messaging also remain relevant today. 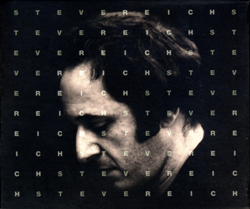 As Reich shifted his attention from tape pieces to acoustic instruments, he transferred his interest in phase shifting to works like Piano Phase and Violin Phase and eventually Drumming. And by the end of the 1970s he had relinquished most of the emphasis on process as a governing formal concept, while retaining the repetitive stylistic elements of classic minimalism, thus producing what we now call postminimalism. But he nevertheless returned years later to the idea of melodicizing speech in projects like City Life (1995) and Three Tales (1998–2002). Indeed it's this constant exploration and striving to extend the parameters of his work that I think most vividly sets Reich apart from his fellow minimalists. Original Material and HTML Coding Copyright © 2016 by Michael Schell. All Rights Reserved.